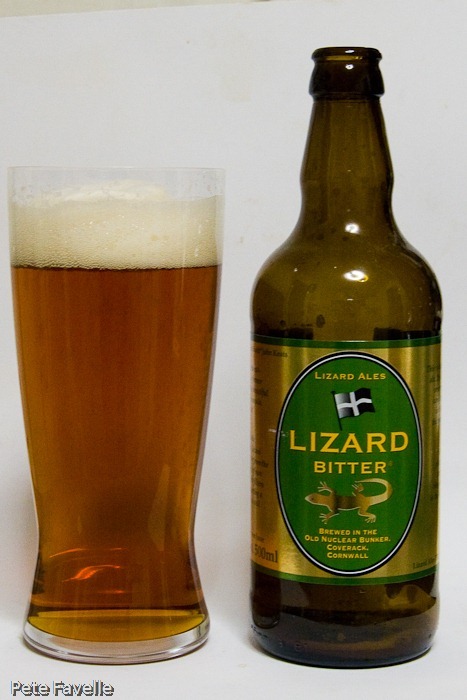 Continuing our round-up of Cornish breweries, we reach Lizard Ales, a brewery which has been based in a nuclear bunker since 2008. It’s somehow comforting to know that even after a nuclear war, we’ll still have some breweries in production. 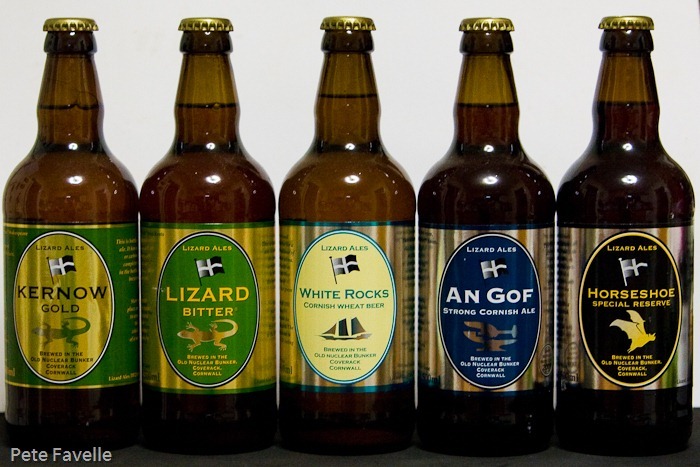 From the look of their website, their range has changed slightly since this collection; White Rocks has gone, and there are two beers not represented here – Frenchman’s Creek and Helford River. 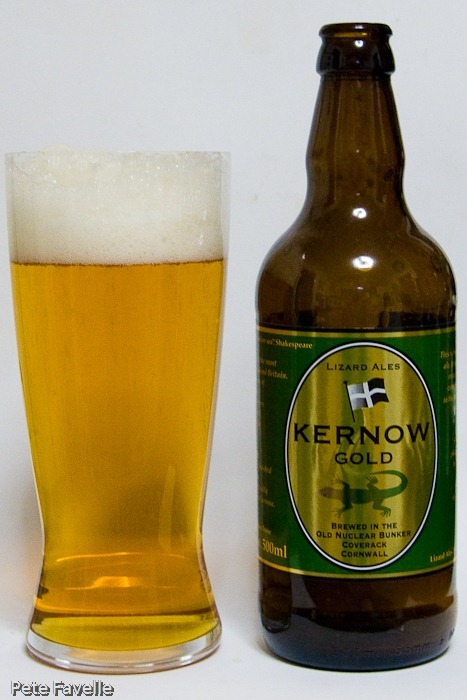 Kernow Gold is a bright golden 3.7% ale, with large rising bubbles and a huge, billowing but short-lived head. The nose is harshly metallic, but under that is a hint of honey sweetness. The body is light and fresh, managing to be foamy in the mouth without being fizzy. 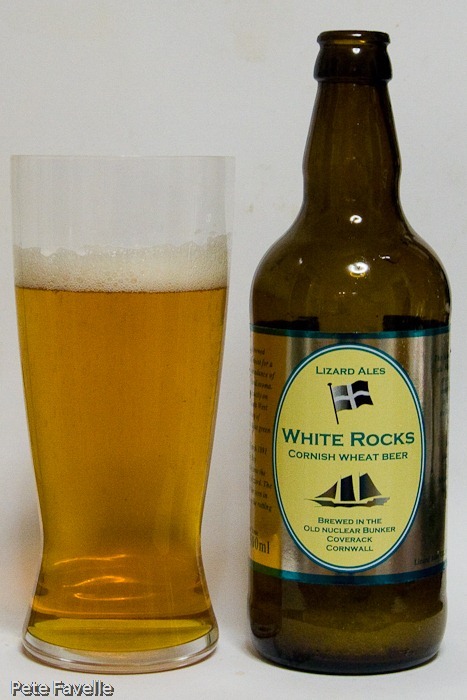 The hops give a nicely floral undercurrent to the flavours and overall it’s a light, sweet and refreshing beer – nothing particularly outstanding, but pleasant and very drinkable. 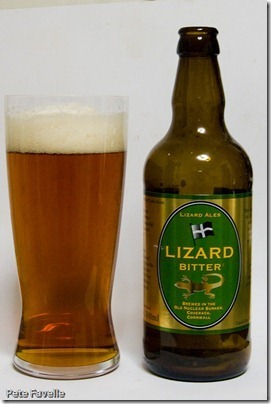 Lizard Bitter is a little stronger, at 4.2%. A nice amber colour, it has a generous but not excessive head on it. 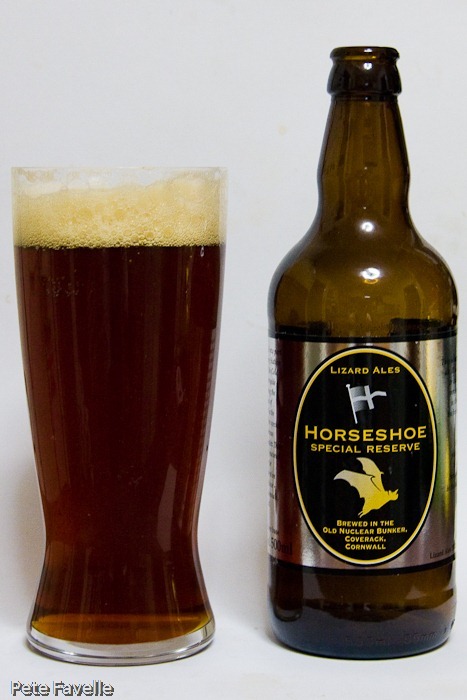 The nose has a little biscuit and just a hint of toffee, along with an earthy hop character. 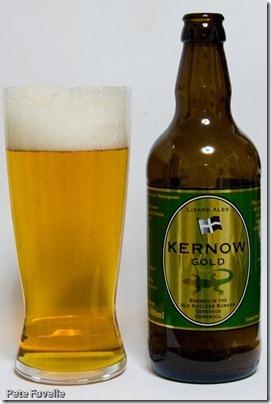 In the mouth, it has a similar foamy nature to the Kernow Gold. There’s a rich sweetness but with a much more aggressive hop bitterness, with just a suggestion of red fruit. It’s a very traditional style Best Bitter; unsophisticated but inoffensive. 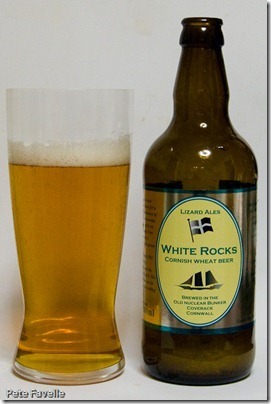 White Rocks, at 5.0% ABV, is a wheat beer. Sadly a lot of this went down the sink as the bottle exploded on opening. Despite this, it remains clear and golden in the glass and rather ironically considering it’s earlier enthusiasm it has a lacklustre head. There’s a slightly wheaty nose, a little citrus fruit, a touch of sweetness and just a slightest spice. The taste is sharp, slightly syrupy but with an almost sour edge to it – it’s unlike any wheat beer I’ve ever had and the odd taste, along with the explosion, makes me suspect I may have a bad bottle. 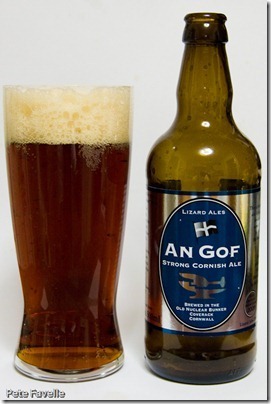 An Gof is a nice, rich red ale at 5.2% with a fluffy head on it. The nose is minimal – just a hint of gently roasted malt, and little else. On tasting, the flavours are pleasant – a faintly smoky maltiness, some nice tannic dryness lurking in the background but as with the nose, it’s so gentle as to be muted. Easy drinking, but nothing to make it stand out from the crowd. 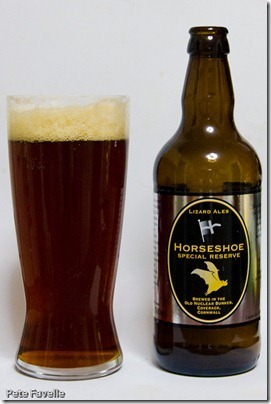 Finally, we reach the Horseshoe Special Reserve, the strongest of the bunch at 6.2%. Another deep red ale, the nose is toffee with just a hint of vinegar beneath. In the mouth, there’s a rich fruity flavour of plums and a nice sweetness but the vinegar touch is in the taste as well as the nose – it’s odd and unusual but so close to being nice that I can’t quite decide if it’s on the edge of being off or if it’s by design. Overall, it’s not an exciting collection. 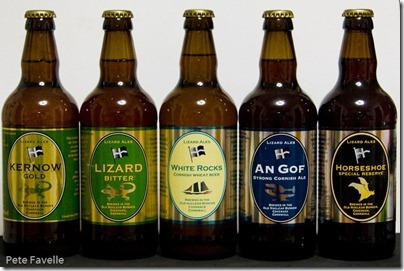 One or two slightly off bottles in a collection of five isn’t a great rate and even the rest, while perfectly decent beers, aren’t standing out from any number of other breweries.